By analyzing the bones of a small, feathered dinosaur known as Sinosauropteryx, paleontologists have mapped its unique color patterning. Incredibly, this creature featured a bandit mask-like stripe across its eyes, similar to some mammals and birds living today. 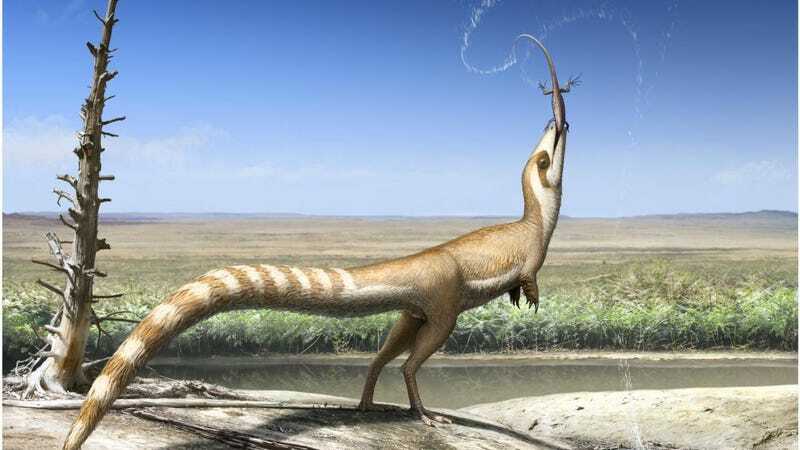 Sinosauropteryx (pronounced “Sine-oh-sore-op-tear-icks”) was first discovered in China in 1996, and it was the first dinosaur (outside of ancient birds and their immediate relatives) to be found with evidence of feathers. A new study published in Current Biology shows that it exhibited multiple forms of camouflage, including countershading (light bottom, dark top), a distinctive striped tail, and a so-called bandit’s mask—the same kind seen in modern animals such as raccoons and skunks. The discovery shows that, unsurprisingly, dinosaurs evolved sophisticated schemes to camouflage themselves (which also implies they had good vision), and that, because similar camo schemes exist today, dinosaurs must have lived in environments similar to ones we see today. Indeed, if there was ever an animal that needed camouflage it was the dinosaur. Sinosauropteryx, which lived around 120 million years ago in what is now China, was a relatively small animal that lived in world filled with fearsome predators—including relatives of the Tyrannosaurus rex. At the same time, camouflage also allowed Sinosauropteryx to sneak up on unsuspecting prey, like small lizards. Using polarized light photography, researchers from the University of Bristol produced high resolution and contrast-rich images of Sinosauropteryx fossils. Fossilized feathers only preserve when they’re pigmented, so by mapping the presence and absence of feathers, the scientists were able to tease out its color patterns. Previous to this work, paleontologists looked at a different specimen, detecting small and round melanosomes (light-absorbing pigments found in skin and feathers) indicative of brown coloration. The bandit’s mask likely provided varied function, including reduction of glare (think of football players who paint dark bands underneath their eyes) or as a way to disguise eyes from predators. Scientists hypothesize that the facial mask of shrikes, a small bird, allows them to hunt into the sun, which helps them detect prey and engage in surprise attacks. Other living birds with dark bandit eyes include the blue dacnis, masked laughingthrush, and nuthatches. The researchers also detected the presence of a striped tail and a very common form of camo known as countershading. With countershading, an animal features a dark back and a light belly, which makes them look flatter and less three-dimensional. Camouflaged this way, animals don’t stand out as much against the backdrop. Animals feature varying degrees of countershading depending on their habitat, and Sinosauropteryx’s particular pattern of countershading suggests it lived in open habitats, like a plain or great meadow. Last year, the same researchers studied another dinosaur found in the same ancient lake bed deposit, but its countershading suggested it lived in a forest.